That’s right; the Great Re-Read of 2011 has begun. Well, one of them, anyway. (Along with A Song of Ice and Fire, Pratchett’s witches and Agent Pendergast slotted for the summer, and now that Mark Reads is on to His Dark Materials, I suppose I need to crack open The Golden Compass again as well). So, here it goes — between now and the release of the last movie, I intend to get through the whole series again, to be perfectly primed for the finale. Re-reading Sorcerer’s Stone is a very mixed experience — so much nostalgia, mixed with so much… awareness, I guess is the right word. Because now, with the retrospective viewpoint, with having read all seven books, it’s hard not to see the vast difference in writing style and in tone between 1 and 7. Even just between 1 and 5, 1 and 3, J K got so much more sophisticated as a writer. Sorcerer’s Stone is, by comparison, a fairy tale. It really does contain so many of those elements — the abused child (but without any of the psychological veracity that would make that situation scary rather than Cinderella-ish), the entry to a new world, the element of sheer dumb luck. And the story itself is so plain-spoken, so straightforward. There aren’t any subplots in this book. So many of the characters are caricatures. Even Hermione is so flat, such a stereotype, without the emotional depth (and cutting wit) she develops later on. It’s just not as involved a story, not so detailed, not so emotionally compelling as the later books. It’s not as complicated, I think is the main thing — this story is so simple. Delightful, but simple. And I do love complications. 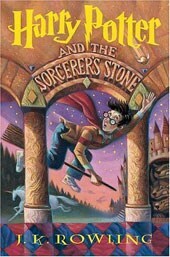 So, with all seven in mind, Sorcerer’s Stone is far from my favourite book. It probably falls between 5th and 6th in ranking, depending on how I’m feeling about Half-Blood Prince on any given day. I can’t help feeling that it really is more of a children’s book than the rest of the series. This is the book that started it all. I remember the giddiness of my first time reading it — all that delight, all that fascination, taking so much joy in J K’s twists and turns, her mythological and historical references. There’s such a sense of joy and nostalgia. (Anyone who doesn’t follow Mark Reads, by the way, totally should — because experiencing both his first read and now walking through his re-read with him hits all those nostalgia buttons so hard. I almost did a chapter-by-chapter breakdown, but with Mark’s out there, it’d be redundant). And it’s not that it brings up childhood for me — I was sixteen when I first read the series (only released to Goblet of Fire) at that point. I picked Sorcerer’s Stone up on a whim at CVS while running errands for my parents, read it when I was supposed to be studying for my physics final, and… it was love at first page-turn. So it’s something else — my love of engrossing story, reawakened each time I open these books. And the value of hindsight works in J K’s favour here, too, because there’s just so much foreshadowing and seeding going on. Sirius Black, Snape and James and Lily’s entanglements, Hermione’s increasing comfort with rule-bending and -breaking. Even the tensions over Muggles and Muggleborns, which get explicated in the next book, are foreshadowed here. What I find really interesting, actually, is the viewpoint of the “good” wizards about Muggles. Even the ones who are pro-Muggle do treat them as primitives, as quaint, interesting little things. Wizarding privilege: not a market cornered by Slytherin, ‘s’all I’m sayin’. Sorcerer’s Stone also contains the very first instance of CAPSLOCK!Harry — it’s brief, but it’s there, as he’s convincing Ron and Hermione they have to go after the Stone. And that made me smile. Ultimately… I will never not love re-visiting this series. The beginning is, in my opinion, weak compared to what comes after… but it’s still the beginning, and it will always have that special glow. What intrigues me about the writing, and I think it is intentional, is that the writing matures with Harry. Think about it. Childhood is often seen as less complicated. Harry isn’t as concerned about others or their lives or their tragedies. He barely grasps the depth of it all. Here, Snape is mean just because he’s a jerk. The good guys win and the bad guys lose. The overall simplicity of the story is representative of how stories are usually presented to kids. The complications build up as Harry grows up and becomes more aware of the dangers surrounding him. I do agree wholeheartedly that there is an excellent what I like to call “reread value” to the Harry Potter series. Once you know everything that happens and come back again, there are just so many little things you didn’t notice the first time around, little important things.